Please note a discretionary £25 surcharge may be made for early check in before 2pm. Should you have to cancel your booking please let us know as soon as possible. A deposit of 1 night per room will be taken at the time of booking with the balance due on departure. The deposit is non-refundable in the event of cancellation. 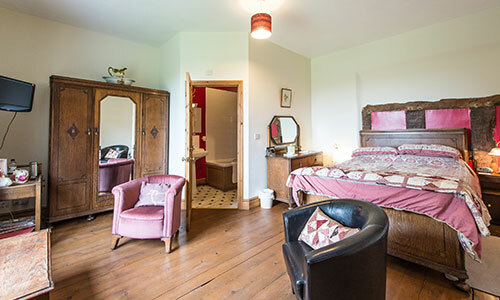 Should you give us less than 72 hours notice (before 2pm on the day of arrival) a charge of 75% of the bed and breakfast value of your stay will be incurred if we are unable to let the room. Please click below or use the ‘contact us‘ form for more information. If you make an online booking please ensure you get a Confirmation email with a booking reference, please ring or email if you wish to double check and to organise payment of the deposit. We offer 4 star accommodation in a beautiful rural location. There is lots of indoor and outdoor space to allow guests to truly relax during their stay, giving a home from home experience. Accommodation in Broome Park Farm B&B is the perfect place to stay for a walking or cycling holiday. There are many waymarked walks in the area and the local Footpath Association work hard to maintain local paths. There are also 3 different circular cycle routes that pass our drive. We are at the southern end of the Jack Mytton Way – Shropshire’s long distance bridleway (for use by those on foot, bicycle and horseback). For more information about exploring the Shropshire countryside please use the Shropshire Great Outdoors website. Evening meals are available upon request and a sample menu can be viewed here. For information about accessibility and our facilities please see our accessibility policy.